Charcuterie Challenge July: Emulsified Sausage – Black or White? “Stop singing!” I said to my son, exasperated, calling from the office over the raucous (false) tenor bouncing and echoing off of the pine ceiling obliterating all semblance of creativity or rational thought, for those of us forced to listen to Jack, anyway. Was he an opera singer in a past life? I’ve never met anyone with such a call to wail indecipherable words out with such abdominal abandon. He also sings to annoy his sister, which was the case today so I felt somewhat justified in cutting off the “music” even with the nagging irony that we ENCOURAGE singing most of the time. Parenting…always a new challenge – and the issues are never black or white. Which brings me to the Charcuterie challenge, black or white? Though I did not follow the apprentice or charcuterie challenges, I was compelled to ask blanc or noir regarding boudin. After some quiet time away from the “opera”, I decided I really wanted to try both of the boudins. The choice though for today was obvious, blanc, as in Boudin Blanc. Why? Because I have eggs, lots of free range eggs, even with a hungry fox out there chasing hens this morning right past the LGD’s. 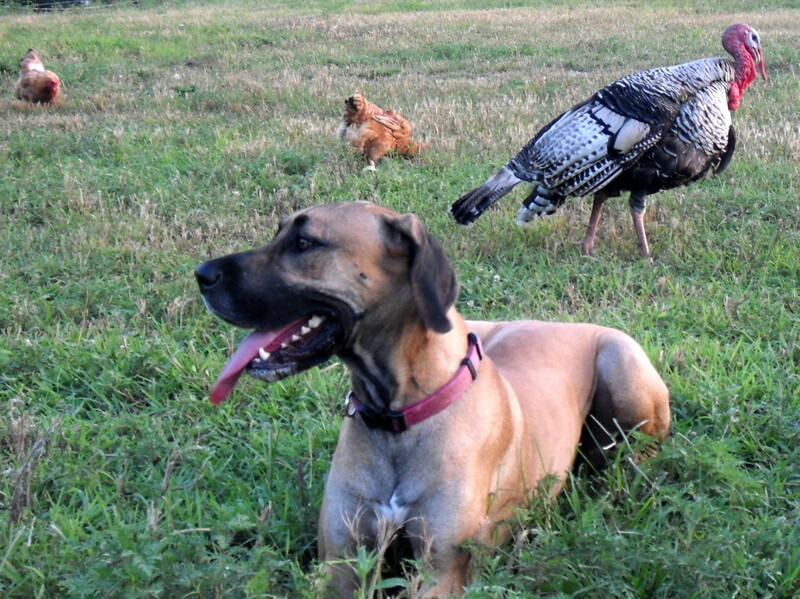 The fox, skinny and desperate was not afraid of the LGD’s or me, until I turned the Dane out. Funny that Lucy, the Dane scared the fox away just by her presence but didn’t see the fox, as she was otherwise too busy chasing doves, again,…sigh. At least she leaves the chickens alone. Boudin Blanc would also work since I had pork shoulder from the farm, chicken breast from the farm, and spices and milk (local) on hand for this intriguing recipe. Though I also have that elusive ingredient for the Boudin Noir as in “Boudin Noir with Apples and Onions” the ingredient that makes the sausage distinctively noir “on hand” on the farm… no one around here is up to procuring said ingredient right now. Nuff said. We got home mid-day after some local shopping, ready to start up our fabulous sausages. 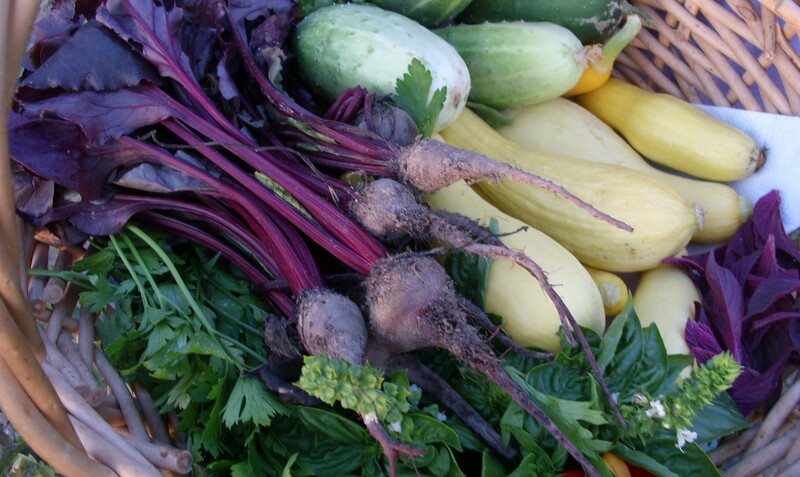 But before we eat, our farm eats. So as we walked the farm, doing the regular afternoon water and welfare checks prior to feeding, we heard a strange noise from the woods where some of the pigs are kept. A baby piglet noise… As Sophie and I got closer, we noticed that there was a strange looking but very small, very dark animal in the pen with Wally, Roselle, Willow and Dixie. Hmmm. It squealed again, jet-black and wobbly, raising a ruckus with Dixie (the alpha) who was investigating, this little newborn piglet caused Dixie to promptly direct the other pigs away, leaving Willow, the momma, alone to labor on. 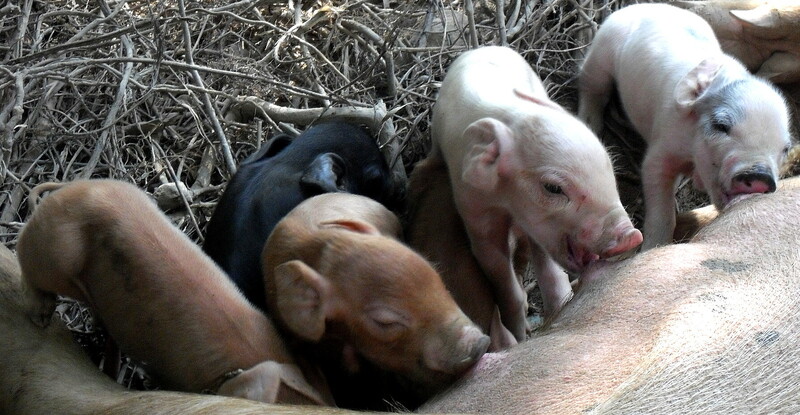 Goodness, more piglets! These were a surprise… 6 born today, 4 boys 2 girls. The little black piglet is a girl. She was obviously the first-born and most sassy! I sense trouble with this one… she’s already been investigating OUTSIDE the enclosure only hours old, she’s got attitude. With an unexpected piglet delivery crowding out our evening (we wanted to be there, just in case) we started sausages late but we were ready this time, we had organized and prepped, and all of our machine parts were pre-assembled with our grinder, and our food processor (which gets used daily) was sparkling clean and ready for action. We ground the 1 inch cubes of pork and chicken breast through the meat grinder, then added the ground meat, salt, pepper and Quatre Epices into the food processor. We added the remaining ingredients per the instructions in the Ruhlman Charcuterie book. After a quenelle check, we added a wee bit more salt, stuffed the meat into the casings and poached the sausages. They were ready to partake in this evenings entrée. 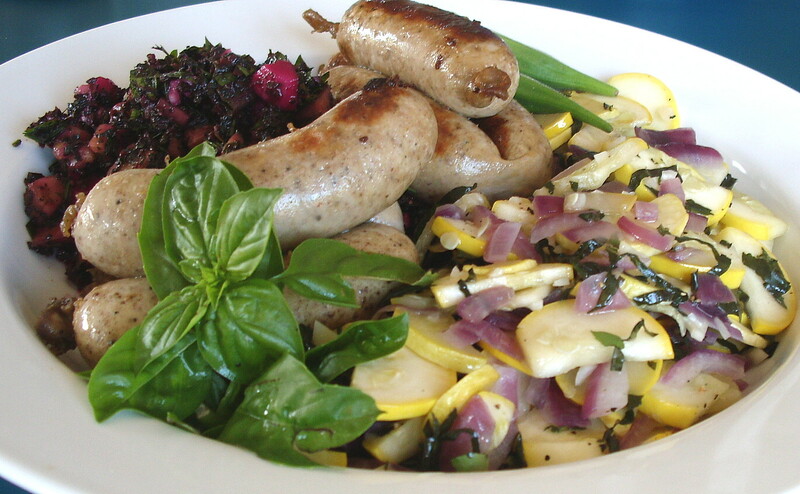 Boudin Blanc with a Beet, Amaranth, Cucumber Chopped Salad and Yellow Squash with Red Onion, Basil and Garlic. 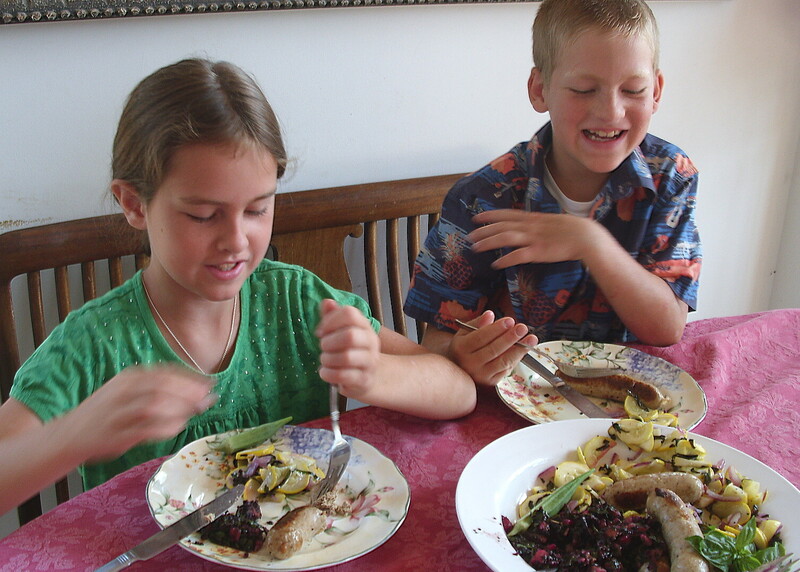 It’s summertime so we’re trying to balance out this rich sausage with a light, beautiful purple salad and fresh yellow squash sauteed with onions, basil and garlic. 1 bunch flat leaf parsley chopped. Combine the first 5 ingredients in a bowl. Whisk together the dressing ingredients in a small bowl or shake up in a mason jar. Add dressing to the salad and serve (this salad can be made a few hours ahead of time, the flavors will develop). Yellow Squash with Red Onion, Basil and Garlic. Sautee red onions with yellow squash until al dente, about 3-4 minutes. Finish the dish by stirring the basil and garlic into the hot squash. Serve immediately. Brown Boudin Blanc sausages until re-heated (they have already been poached to an internal temp of 160). This meal was delicious. All of the produce ingredients in the salad and squash were picked the same day and were bright and sweet tasting, a perfect compliment to the nutmeg and cinnamon in the sausages. If I were to serve this in the winter, I would serve the sausage with mashed sweet potatoes and a simple radish salad. This recipe is a keeper, the kids loved it! I have fond memories of “Blood Pudding” (similar to Boudin Noir) a cow or pig blood pancake that I used to enjoy a long time ago served up as an entrée during elementary school lunch – in Stockholm Sweden, while my family lived there on sabbatical. Nothing around here is always either black or white. 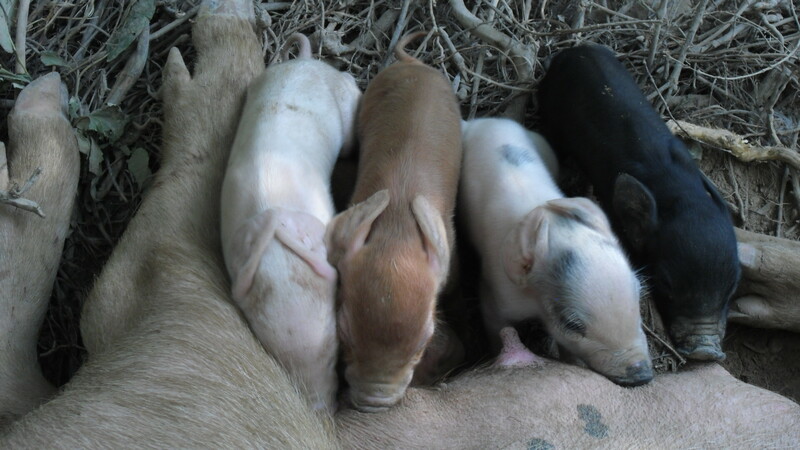 Parenting, cooking, animals – except maybe today when it comes to sausage and newborn piglets… Thank goodness for shades of gray! And the Boudin Blanc was fantastic…I mean really, look at the ingredients, how could it not be? Congrats on the new additions. I hope all is well. Your boudin blanc and salad sound delish; I’ve never had amaranth before. Thanks Holly! It was wonderful. The amaranth plants volunteered from last years crop, the leaves can be cooked like spinach, the smaller leaves are best raw as they can get a little bitter when they get larger. Cute photos of the kids. Nice shirt – Jack. More Piglets? When were they born? I am craving the PESTO recipe you made. It was so creamy and flavorful. Can you post that recipe? Thanks Cousin! The pesto recipe is posted here: http://wp.me/pYivg-g2. Piglets arrived on the 15th of July, out of 6 total, 5 made it. 4 males, 1 female.